Is this normal? 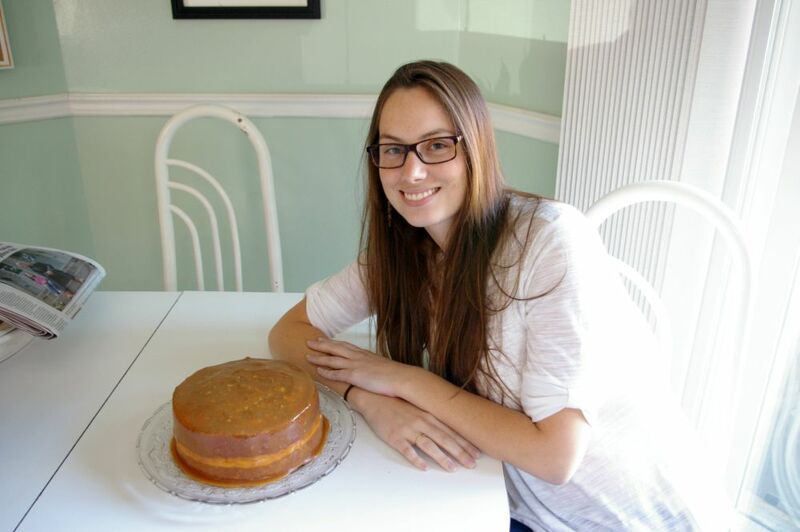 Is it normal that I bake for a living, and when I’m not at work all I think about is baking? It just happens. I don’t even realize that I will be walking the dog one moment and then BAM I’m in the kitchen baking a cake. Todays cake? 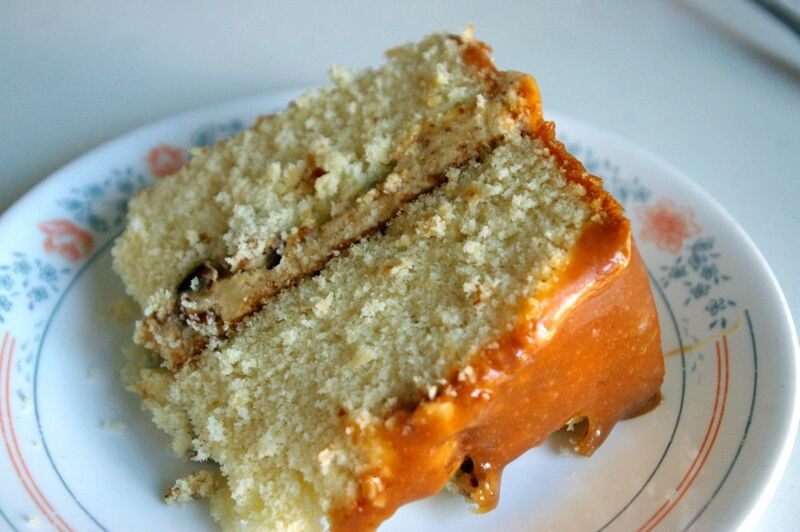 A vanilla cake with almond hazelnut cream filling and sticky caramel deliciousness. WHY OH WHY DO I DO THIS? Because it’s delicious. That’s why. This cake is now one of my favourites. Me. The girl who doesn’t like hazelnuts. 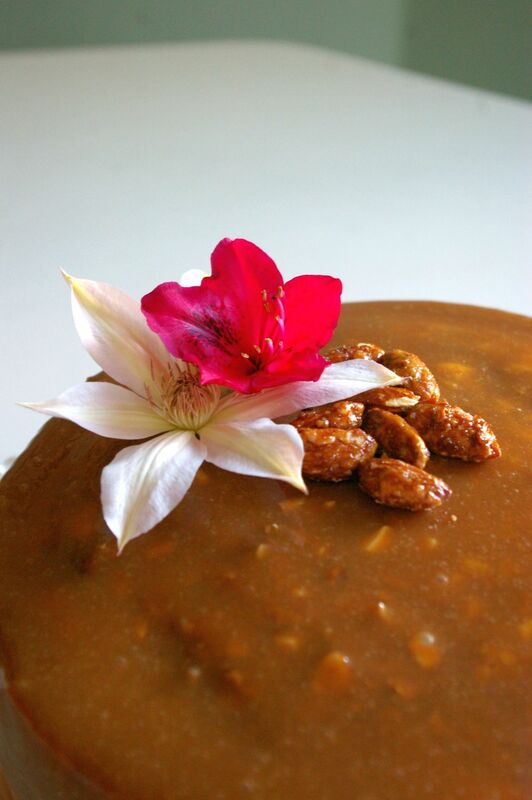 The cake, so soft and velvety, the filling so hazelnutty and creamy, and the caramel glaze just so smooth and sticky sweet. Yet somehow the cake as a whole is not too sweet. Perfect really. Baking is therapeutic for me. There’s going to be a lot of it happening over the next two months. Prepare thyselves! Preheat oven to 350F and grease and set aside two 8″ cake pans. Mix together the milk, whites, vanilla, and hazelnut oil. Set aside. Combine the flour, sugar, baking powder, salt and butter in a mixing bowl. Add about 3/4 cup of the liquid and mix until combined. Whip on medium speed until light and fluffy, for about 2 minutes. Scrape down the sides of the bowl and then slowly pour in the liquid until all combined. Scrape down the sides of the bowl, and beat for a few more seconds until beautifully homogeneous. Divide the cake batter between the pans, toss some chopped candied hazelnuts on top and bake for 30-35 minutes until it springs back when lightly touched and a toothpick inserted in the centre comes out clean. Whip the eggs, sugar and salt over a bain marie until hot to the touch and the sugar is dissolved. Transfer to a mixing bowl and whip on high speed until cooled down and super fluffy. Add in the butter and whip until combined. Then mix in the hazelnut butter. Fold in the whipped cream. Delicious! In a saucepan, heat together 2 1/2 cups of the sugar with the corn syrup and milk. Keep hot. In a separate saucepan, bring the remaining 1/2 cup of sugar to a caramel. As soon as it starts to smoke, slowly pour in the milk mixture. Continue to heat until 235F. Remove from the heat and stir in the vanilla and butter. Transfer to a bowl on the stand mixer and beat with the paddle until thick and “spreadable”. Then you can put it on the cake! In a perfect world I would have had a cake board and poured it over top over a cooling rack so I didn’t have a messy bottom edge, but…alas, no cake boards for me. so, messy bottom edge it is! The cake is fairly heavy once all assembled, so I was worried it would break if I tried to move it off the cooling rack once it was set. Boourns. Wouldn’t it be cute to dip some whole hazelnuts in a thick caramel so they had long pointy tips? It would be. But…no whole hazelnuts for me. 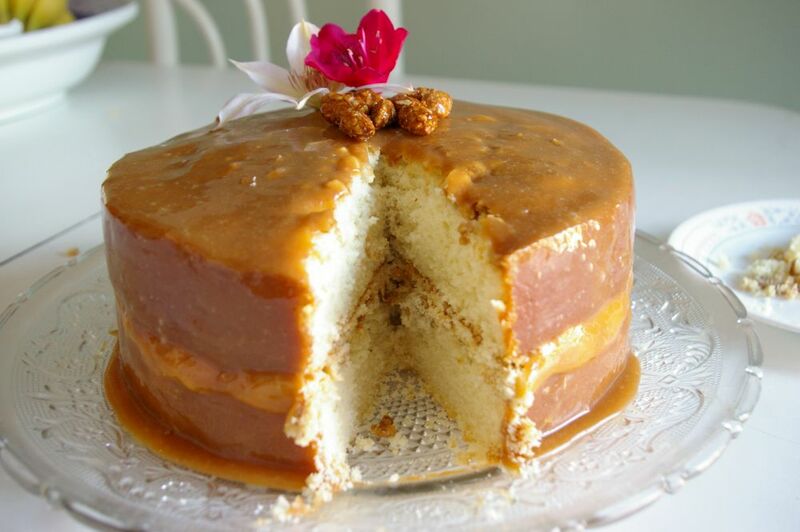 This entry was posted in Cake, Delicious things I think are pretty delicious and tagged caramel, caramel glaze, hazelnut butter, hazelnut cream, hazelnut oil, white cake. Bookmark the permalink. Ok THAT looks scrumptious , baking this asap. 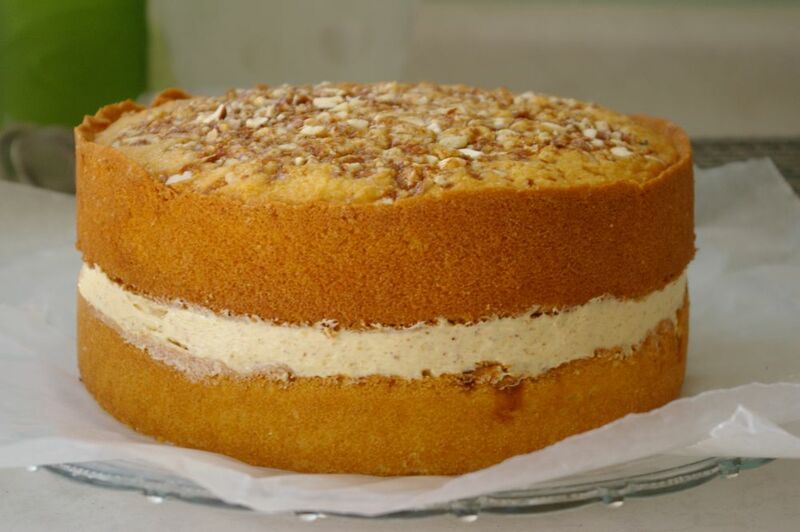 Just had a few questions , the hazelnut buttercream in between, is it very mildy sweet? i see it only uses 1/3 cup of sugar so was kinda wondering with all that hazelnut butter ( Which im planning in grinding myself so no extra sugar) and cream, whether 1/3 cup sugar would suffice? Hi redpink! 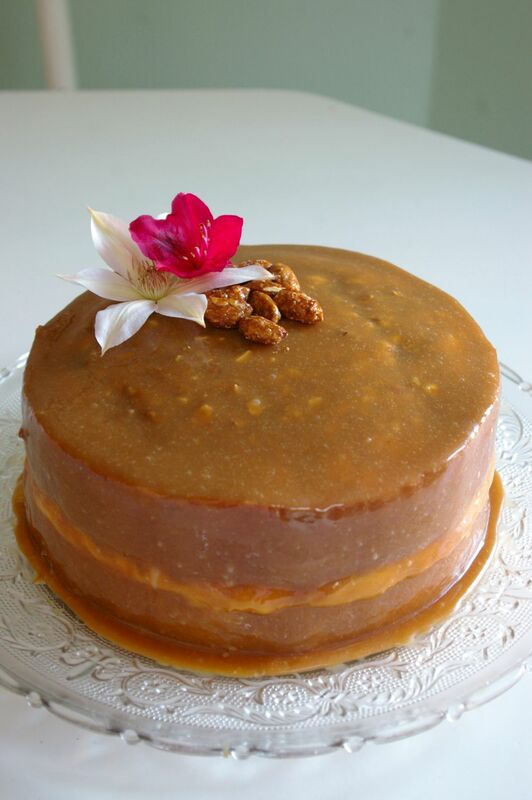 considering the cake is covered in caramel, I don’t see why the 1/3 cup of sugar wouldn’t be enough 😉 The hazelnut butter I used contained no added sugar as well, so in theory it should be just fine with your own home made hazelnut butter.